I realized that lightning damage is underused in my builds. And I never tried Light's Defender until now. It's a Vindicator making heavy use of Storm Totem, Wind Devil, Storm Box of Elgoloth coupled with a bunch of lightning procs including Hand of Ultos and Reckless Tempest. Your graphic card will probably howl with pain during this build's gameplay. Even without rare green items for additional totems and Storm Totem CDR its performance is supreme. Shreds Crucible in 9 minutes. Hard and fast action! Build's core is pretty much self-explanatory. 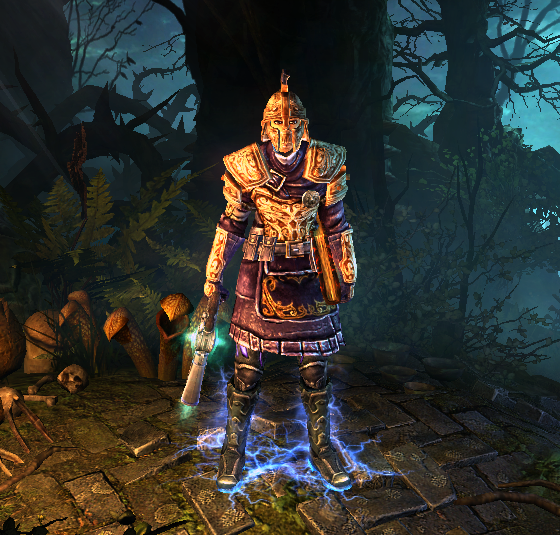 Full Light's Guardian set, full Cataclysm set. Arcanum Electrollis is needed to keep the ranged playstyle and not engage heavy hitters in close range. Also its RR/CC proc is pretty good against trash mobs. Can be replaced with Mythical Exonerator for additional chain lightning, but you lose some skill bonuses. Savagery provides slow resistance, OA/DA, minor attack speed (we don't need it either) and minor ADCtH. Our main source of sustain is Hand of Ultos dealing summary 240% WD on 10 targets per second. With Haunted Steel you are unkillable if many trash mobs surround you, and you outheal fast enough even on nemeses. As a side effect, this build has ~260k electrocute ticks in Crucible. Aggressive hybrid combat. Place totems, Inquisitor seal, Wind devils, Storm shards, all that mess, and make pew-pew with Savagery from time to time to keep charges up and proc Reckless Tempest. Surprisingly Anasteria and Aleks are not annoying. You kill them safely, but be careful anyway. Hard physical hitters are facerolled if they're single, but avoid double Reapers and such combinations. Last edited by veretragna; 12-24-2018 at 09:41 PM. Do you really need to use a gun to use might of the boar? I've had a similar build since shortly after AoM release and I prefer the rune of elgoloth. It has a vastly better proc and honestly better +skills as well. Didn't try Rune of Elgoloth, but I already love it. Thanks! Reasonable suggestion. This gun was just a first thing that came to my mind. That's a great build, congratz. Watched the video, was really impressed with how smooth the build was despite lack of physical resist. One minor thing that didn't make sense to me is the choice of weapon/off-hand augments. I am not sure why you went for Malmouth Soul: flat damage is useless here as well as pierce overcap. Moreover, you are missing out on additional OA/hp/regen (even racial damage if you go for double Outcast's Wrath). Good point made by Avyctes, Rune of Elgoloth would be great here. Or maybe even Spark of Ultos, depends on how badly you need +1 to shaman skills, because 5 second to WD life plus additional 200% lightning damage might outweigh single target RR proc. These augments are remnants of previous variation of this build with not capped resistances - it was a melee vindicator with 3pc Ultos and DW Crystallum. Yes, I'll replace them with yours, thanks! And I'll post this dw one if I'm sure in its survivability - not in current state though. This build already does the job in 9 minutes, and it can perform even better with proper weapon! Love it. Or maybe even Spark of Ultos, depends on how badly you need +1 to shaman skills, because 5 second to WD life plus additional 200% lightning damage might outweigh single target RR proc. 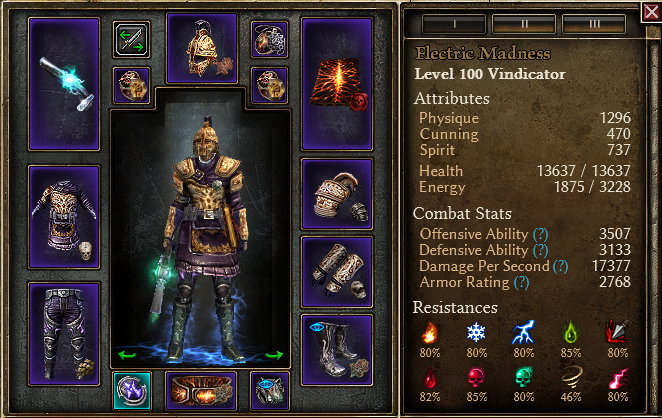 The 15% elemental reduction has a nice synergy with the cataclysm set as well, with those constant elemental novas. Matter of taste I suppose, both will work. From my experience, it's a matter of testing it out. I had this problem every time I was making a build that I theorycrafted in Grimtools into life: something that looked so pretty on paper was really underperforming and bringing the whole build down, but something that was a worse and less obvious choice on paper was actually making everything click. Single target RR is better, I think: it allows you to rush and disintegrate random first nemesis on wave 160 or 170. Or Theodin.